DRF1262T based on SX1262 sub-GHz radio transceiver is ideal for long range wireless applications. Comparing to last generation of Lora chips sx1278/sx1276, the sx1262 has less receive current (about 4.6mA) current and higher output power (up to +22dBm). DRF1262T keeps the advantage of sx1262 and frees the engineers from designing RF circuit. DRF1262T adopts +/-1ppm TCXO IT2105 from Rakon, which increases the receive current up to 5.8mA but provides advantages of long-term stability and longer communction distance. Besides DRF1262T module, DAD06 testing kit also can be used together with DRF1262T module to establish fast communication based on ST Nucleo and Arduino UNO board. 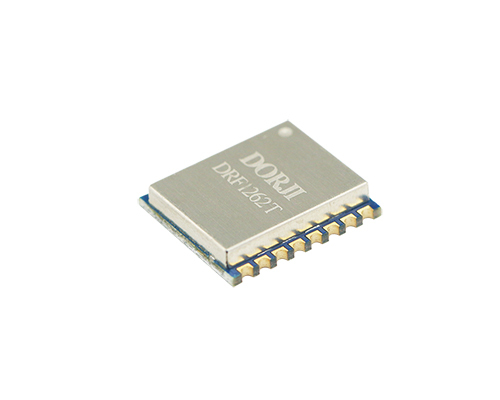 Users of DRF1262T module can contact the sales of DORJI for samples codes based on Arduino or STM32 series. Users also can choose DRF1268T for 433MHz TCXO version of sx1268 module. If users don't seek for the highest sensitivity and lowest air data rate, DRF1262G with normal crystal will be a good option for cost-efficient projects.